Britain’s most senior police officer has vowed to protect the Islamic community after the death of a Muslim shopkeeper in Glasgow. 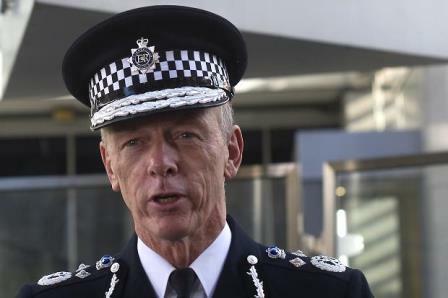 Met Commissioner Sir Bernard Hogan-Howe told worshippers at the country’s largest mosque, Baitul Futuh in Morden, south London, that his officers will keep them safe. Asad Shah, 40, an Ahmadi Muslim, was stabbed to death outside his convenience shop in the Shawlands area of Glasgow in March.Speaking after Friday prayers, Sir Bernard promised to stamp out extremism and intolerance.”The particular reason for being here this afternoon is to stand with you after recent events in Glasgow,” he said. “A man was murdered, an Ahmadi … and there has been some speculation which has concerned people about why this man was attacked, perhaps because of his faith.”I want to reassure you that we the police are here to look after you, I want to stand by you and make sure you are protected. Tanveer Ahmed, 32, from Bradford, West Yorkshire, has appeared in court charged with Mr Shah’s murder. Share the post "Police chief visits Mosque to pledge protection after Asad Shah death"